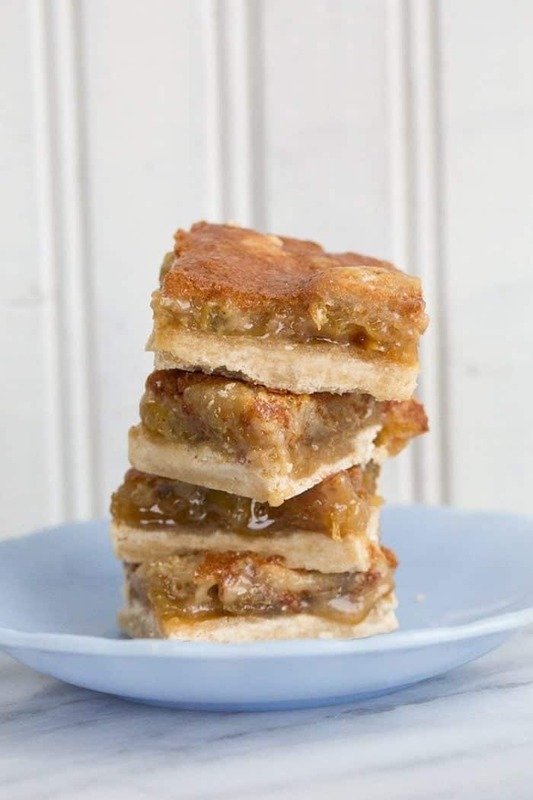 Butter Tart bars or butter tart squares are almost as easy as my homemade butter tarts! You can make these in no time at all and they are just as delicious as a real butter tart is! Butter Tart bars are almost as easy as my homemade butter tarts. Almost. You do have to make a crust for these, but it is incredibly simple to whip up and they are a crowd-pleaser, let me tell you! There is nothing like a batch of butter tart bars hidden in your freezer for when company comes over. And I do mean hidden! If anyone knows that there are butter tart bars in the freezer, they won’t last long! Can I put walnuts or pecans in butter tart bars? Now, I don’t actually put any nuts in my butter tarts but I have been known to add nuts to these. It depends on what mood I am in at the time. Oh fine, it actually depends on whether or not I am organised and have nuts in my pantry to use in them. You caught me. I am pretty sure that I have lost small children in my pantry, it’s so disorganized. Which is scary because I organize it at least 6 times a year. It just won’t stay clean! 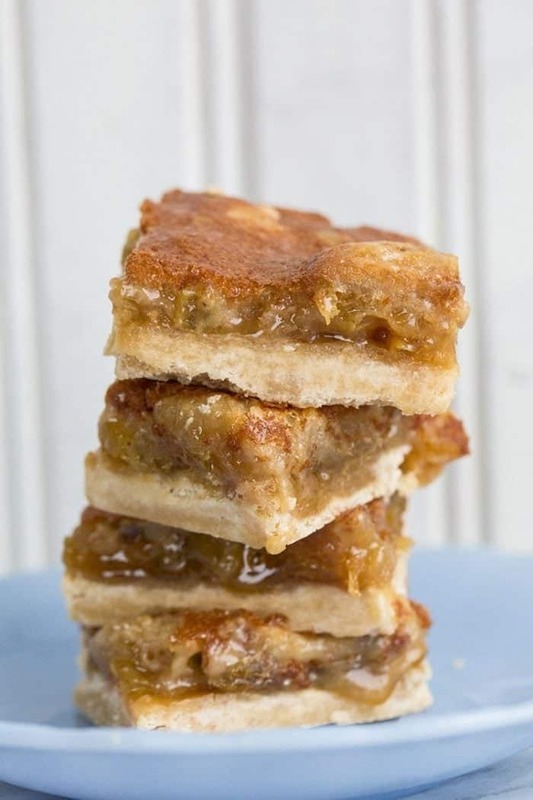 So the long answer to the short question is YES you can put nuts in these butter tart bars! 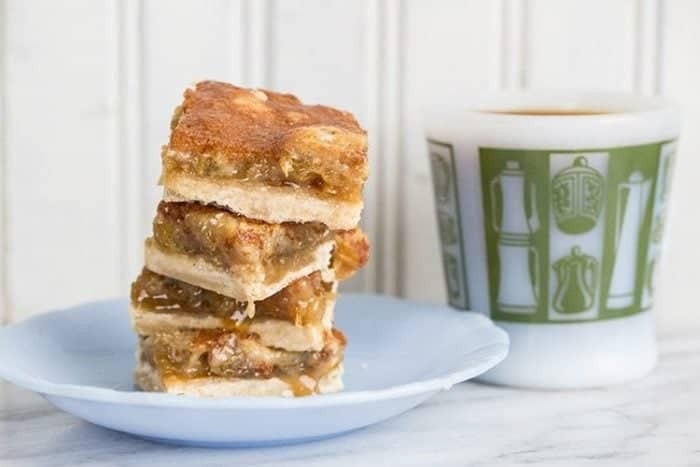 Butter tart bars are THE way to get that butter tart flavour that we all love with the least amount of work possible, with maximum payout. True, they aren’t as easy as using pre-made tart shells for a few dozen butter tarts that you whip up, which is my time-saving trick, but you can bake up a couple batches of these and freeze them in no time at all. Make sure to let them cool completely in the pan before you slice them! Can I freeze butter tart bars? Make sure to cut them before you freeze them – I find that it’s just easier to slice bars before they head to the freezer. Get a good quality plastic container and you can freeze two layers of bars at a time, following step three below. To prevent freezer burn try to wrap the bars one layer at a time with plastic wrap. I find that putting them in a plastic sealed container doesn’t always prevent freezer burn. Make sure that there is wrap between the layers. If you follow the steps above there is no reason that they won’t last in your freezer for 1-2 months. It’s wrapping them so that you don’t get freezer burn OR take on any of the other “scents” in the freezer as well. 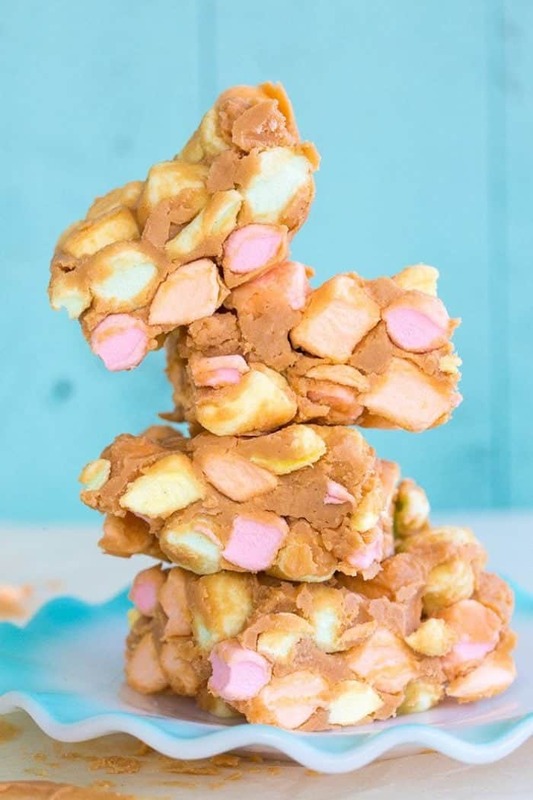 If you are looking for another retro recipe that is seriously the bomb, try my Peanut Butter Marshmallow Squares / Confetti Bars as pictured above. Now THESE don’t last in the freezer, mainly because they taste amazing frozen!So who here makes butter tart bars? Has made them? WILL make them? Pin this recipe to your Christmas Baking or Dessert Boards and Remember to FOLLOW ME ON PINTEREST! Combine the first three ingredients in a bowl until crumbly. Press the mixture into an ungreased 9x9 pan and pop into the oven. Bake for about 15 minutes, until browned. Combine your brown sugar and your eggs together well. Bake at 350 degrees until beautifully browned, about 18-20 minutes. Pecans and walnuts are exceptionally good in this! I was not a fan of this recipe. The filling is too runny & messy. I’ve seen others with a firmer filling & they cut up way better. I also found this version too sweet. Are my squares supposed to be juicy in the middle when they are done? You didn’t say what temp to cook the crust at. I ‘m another Canadian making buttertart squares! I made 1.5 times the recipe to fill a 9×13 pan. I used an oatmeal shortbread crust to replace the plain flour one (replace 1/3 the flour with ground oatmeal and add a bit of vanilla extract). I used equal amounts of raisins and chopped pecans. Couldn’t believe how incredibly easy these were to make. I brought these to co-workers for a Canada Day treat. Huge hit! They didn’t last long. Next time, I’ll need to double the recipe. Hi, I’m so excited to make this recipe! How many days ahead can I make and store the mess yummy treats before serving them? Thank you! 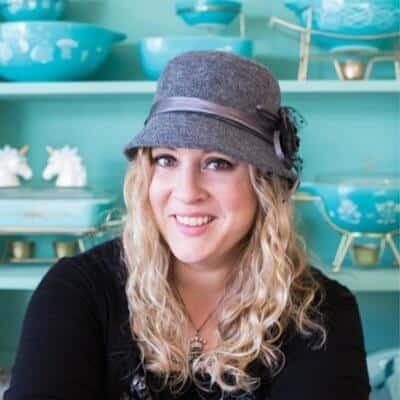 The only difference in this recipe compared to mine is 1cup of brown sugar vs my 1.5! It’s been so long and I’m so excited to make them! I know they’ll be fanatastic. Just made the Butter Tart Bars and they are AMAZING!!! If you love pecan pie you will definitely enjoy these bars. They were very easy to make and perfect for the holidays. I almost cried when I saw this recipe. I an Alberta native (Cold Lake) who transplanted to the Eastern U.S, and I miss butter tarts around the holidays. I usually make the bars (and those PITA shells) from scratch but found myself short on time this Thanksgiving. 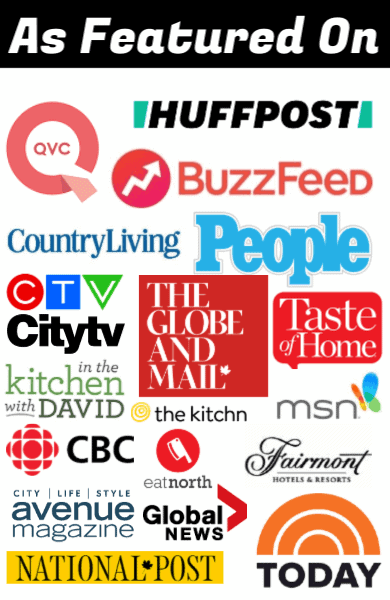 So, to the interwebs I went, skeptical, of course that the recipes I would find wouldn’t be authentic Canadian. My fears are assuaged! Excellent recipe! It will look really giggily in the middle but it’ll settle as it cools. I like mine runny so I let them cook until medium brown. The edges / outer areas were solid and the inner area runny. Loved these squares and usually have all the ingredients in the cupboard. They were raved about and I’ll definitely be making them again! They are better when a little bit runny, just like real butter tarts! Glad you liked them! Do you know if this recipe doubles well? Oh my gosh! I’ve done silly things like that I am supposed to know better! If only you knew all the recipes that had to be started ALL over again! Thanks for reminding me these are on my Christmas baking list! Let’s see. A couple things might be that the butter/flour/brown sugar wasn’t mixed together enough it needs to be very well mixed, no pea if you used margarine with a high water content -diet ones etc- or the brown sugar was stuck together making crunchy bits -so done this. The crust has never failed me! Yet. I better watch out saying that. Try mixing it really well, using fully loaded margarine (you can bake it longer than butter) a slightly lower oven temp and baking it longer. I hope it works because these are just amazing! Glad you love my icing and really glad you’re sticking around reading more! @Scoop did you bake the crust and let it cool completely? And butter mixture back to room temp before adding it on top?? I’ve found that to be my prob in the past.